This article provides an introduction to the basic concepts of earned value management (EVM), from initial project planning through execution including data analysis techniques and baseline revisions. 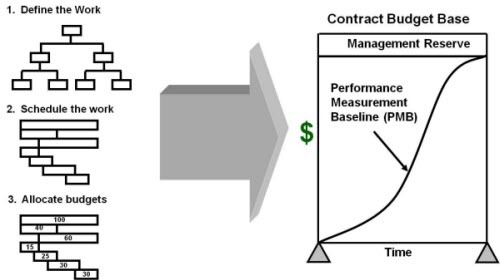 The intent is to inspire an appreciation for the earned value concept and emphasize how performance measurement techniques can be a valuable management tool. 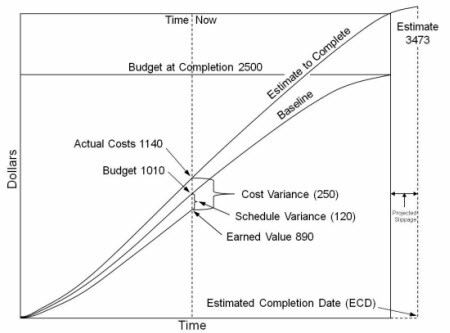 The earned value concept improves upon the standard comparison of budget vs. actual cost which lacks an adequate indicator of progress. Earned value is a value assigned to work which was accomplished during a particular time period. This value can be stated in any appropriate measurable unit such as hours or dollars. 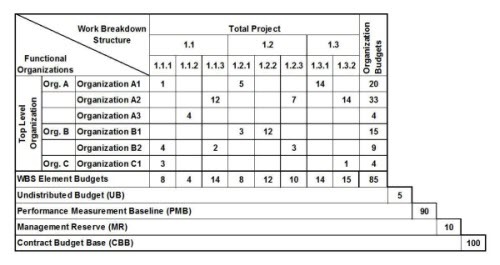 Earned value, and Earned Value Analysis (EVA), thus provides progress information that can be compared to the planned budget and actual cost -- to provide additional insight into project status (and for the EVM analyst). The concept of earned value management became a fundamental approach to program management (EVM project management) in 1966 when the United States Air Force mandated earned value (USAF EVMS) in conjunction with the other planning and controlling requirements on Air Force programs. The requirement was entitled, the Cost/Schedule Planning Control Specification (C/SPCS). Over the decades, the concept and its requirements have remained basically unchanged. It has had periodic updates to its title: Cost/Schedule Control System Criteria (C/SCSC), Earned Value Management Systems Criteria (EVMSC), and the current 32 guidelines in the EIA-748 Standard for Earned Value Management Systems (EVMS). The EVM concept presented in these requirements is a sound management approach, that once incorporated on any type of program, whether research and development, construction, production, etc. provides all levels of management with early visibility into cost and schedule problems. Earned value management is now used on programs world-wide. Primary EVM users include the United States, Europe, England, Canada, Australia, China, and Japan. It is a requirement of many U.S. Government agencies, including the Department of Defense (DoD), the National Aeronautics and Space Administration (NASA), the Department of Energy (DOE), the Intelligence Community, the Department of Homeland Security (DHS), the Federal Aviation Administration (FAA) and Department of Transportation (DOT), Health and Human Services (HHS), and others. Relate time phased budgets to specific contract tasks and/or statements of work. Provide the basis to capture work progress assessments against the baseline plan. Relate technical, schedule, and cost performance. Provide valid, timely, and auditable data/information for proactive project management analysis and action. Supply managers with a practical level of summarization for effective decision making. Budgeted cost for work scheduled (BCWS), sometimes called the planned value. Budgeted cost for work performed (BCWP) or earned value. Actual cost of work performed (ACWP). Estimate at completion (EAC) which is comprised of the cumulative to date actual cost of work performed plus the estimate to complete the remaining work. Schedule variance (SV) which is calculated as BCWP minus BCWS. A result greater than 0 is favorable (ahead of schedule), a result less than 0 is unfavorable (behind schedule). Variance at completion (VAC) which is calculated as BAC minus EAC. A result greater than 0 is favorable, a result less than 0 is unfavorable. 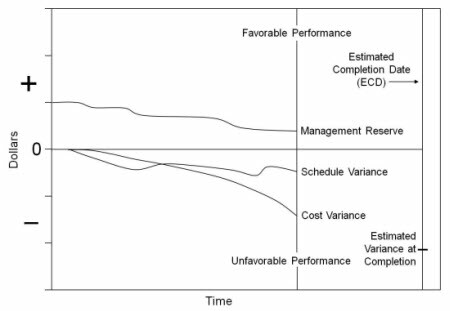 The Analysis and Management Reports section below illustrates using the EVM analysis variances to track trends over time as a management tool for EVM. The 32 guidelines in the EIA-748 Standard for EVMS are divided into five sections which are discussed below. This first section includes 5 guidelines that focus on organizing the work. One of the most fundamental is that the contractor must establish a work breakdown structure (WBS) extended down to a level that describes the tasks that will be performed as well as their relationship to product deliverables. Also critical is the organization breakdown structure (OBS) that identifies who is responsible for the work effort defined in the WBS. 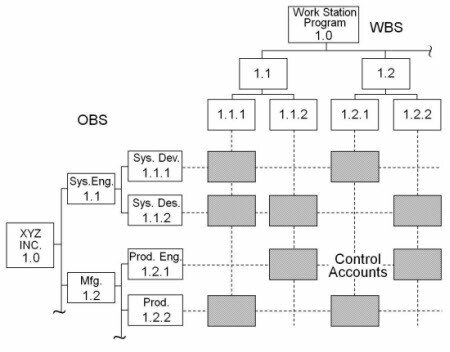 It is at this level where the WBS (what) and OBS (who) intersect that defines a control account, a key management control point. The person responsible for the work effort (scope, schedule, and budget) is the control account manager (CAM). This is the foundation for ensuring the contractor’s planning, scheduling, budgeting, work authorization, and cost accumulation processes are fully integrated -- for the EVMS contractor's compliance. Establishing the control accounts is illustrated below. The second section includes 10 guidelines that cover the basic requirements for planning, scheduling, and establishing the time phased budgets for the tasks. The integrated master schedule is the project’s road map to meet contract objectives. This schedule must be resource loaded to determine the budget for the work as scheduled. The resource loaded schedule is the basis for the monthly budget, or BCWS, for each task and thus the project. This time phased budget is the performance measurement baseline (PMB). The total budget for each task, control account, or the entire project is defined as the budget at complete (BAC). Because most projects are initiated with some level of uncertainty; i.e. risk, project managers typically set aside a portion of the total project value as a management reserve (MR). MR added to the BAC equals the total project budgeted value, defined as the contract budget base (CBB). This is illustrated below. All of the budgets on any project should be logged for successful baseline control. Occasionally contracted tasks may be temporarily held in abeyance, not yet authorized to a manager. When the project manager has yet to assign tasks and budgets to the CAMs, such as an authorized, not yet negotiated additional work, the task and its budget can be retained in undistributed budget (UB). 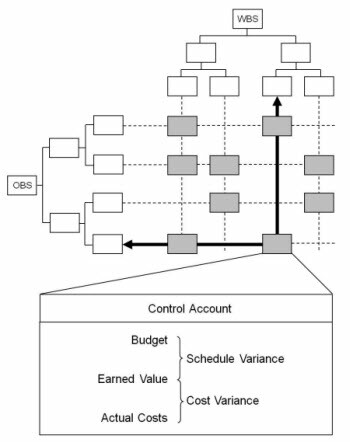 These budget assignments, the WBS, and the functional organizational identity of the managers can be captured in a matrix as illustrated below. A very important aspect of the planning and budgeting process is to determine how BCWP will be assessed. This determination begins with classifying work tasks as one of three types: discrete, apportioned effort, or level of effort (LOE). From this initial classification, for each discrete work effort work package, the CAM selects an earned value technique such as milestones, 50/50, 0/100, or percent complete. It must be stressed that work only begins when there is formal work authorization to proceed. This requirement is a disciplined approach to clearly define work, schedule, and budget before work commences and actual costs begin to accrue. How can someone be expected to manage the work effort when it is unclear what is to be done? The ad-hoc approach to managing, “Give me a charge number and I’ll tell you when I’m done with whatever I think I am supposed to do” does not work. The principles of EVM are quite clear in this regard. The fourth section of 6 guidelines is very important, inasmuch as it requires human attention to cost and schedule variances, documenting cause, impact, and correction action, and determining a new estimate at complete (EAC), if warranted. The variance calculations during Earned Value Management analysis are typically done at the control account level which provides the ability to summarize the data up through the WBS and/or the OBS. This is illustrated below. As needed, the CAM or others can drill down from the control account level into the detail data analysis to identify the root cause of a variance, determine the impact of the variance on future work effort, and identify correction actions. The use of the EVM data analysis indices is a common practice to help managers consider their past performance and their future performance to complete the work within the approved EAC and estimated completion date (ECD). This is illustrated below. The cost and schedule indices are featured in commercial off the shelf project management toolsets and should be carefully reviewed during each reporting cycle. They serve as a valuable validity test to the estimate at completion. The final section is a set of 5 baseline control guidelines that emphasizes disciplined and timely incorporation of customer directed changes, including stop work orders (SWO). The rules also apply to internal replanning and project analysis. Lack of baseline control can doom a project. Establishing and maintaining a schedule and budget baseline is essential to be able to assess work accomplished for each reporting period. The Revision and Data Maintenance section is a must for proactive, meaningful earned value management when there is a constantly changing baseline. Improves project visibility and accountability.